Students who successfully take B2 First for Schools will receive the same internationally accepted certificate as candidates that take B2 First. 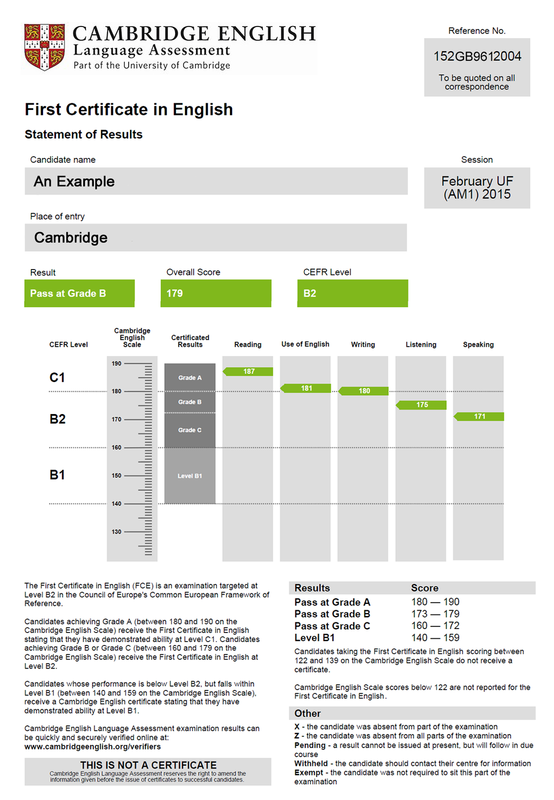 From January 2015 B2 First for Schools (FCEs) results will be reported on the new Cambridge English Scale (replacing the current candidate profile and standardised scores). Exceptional candidates sometimes show ability beyond B2 level. If you achieve grade A in your exam, you will receive the B2 First certificate stating that you demonstrated ability at Level C1. Join The Cambridge English dedicated Advanced Facebook page for help with exam preparation.